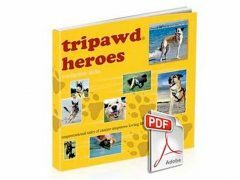 Many Tripawd parents have mentioned neoplasene (also known as bloodroot) in our Tripawds Discussion Forums as a way to avoid conventional chemotherapy for certain types of dog cancer tumors, like mast cell cancer. But up until our June 3 Tripawd Talk Radio show with Dr. Avenelle Turner, DVM, Diplomate ACVIM (Oncology), from the Veterinary Cancer Group in Southern California, we didn’t know much about this alternative treatment. Listen below, or wherever you enjoy podcasts. However, after Dr. Turner fielded a caller’s question about the efficacy of neoplasene during our show, she was kind enough to send us this downloadable white paper about neoplasene from the Journal of the American Veterinary Medical Association. Neoplasene is known as an “escharotic” treatment that’s prepared with an herbal concoction containing bloodroot. This preparation is injected into the tumor site and is supposed to cause necropsy in subcutaneous tissues, which will supposedly cause subcutaneous tumors to die without any chemotherapy treatment. Neoplasene was almost extinct after the 1970s invention of frozen tissue sectioning, but has recently been brought back into the spotlight as an alternative cancer therapy for humans and animals. “Escharotics may be manufactured without regard to accepted standards and therefor may contain unknown quantities of pharmacologically active compounds or toxic adulterants. In the absence of biopsy prior to the escharotic administration, escharotic treatment precludes accurate histologic identification of tumor type. Escharotic treatment prevents accurate in vivo or histologic assessment of tumor margins. This is particularly important for invasive tumors of the skin and subcutis, such as mast cell tumors, soft tissue sarcomas and injection site sarcomas. Inadequate evaluation of tumor margins may result in cancer recurrence, possibly accompanied by more aggressive tumor behavior. Escharotic treatment is painful and cosmetically unappealing. Escharotic treatment has no documented history of success in human or veterinary medical literature. Read the frightening neoplasene case studies about two dogs who had horribly painful and costly reactions to neoplasene treatments by veterinarians, and you will probably want to do all you can to avoid this unproven, risky treatment for your dog’s cancer. Download this white paper about neoplasene dangers today! Thanks so much for sharing your opinion. Since all dogs are different in how they react to cancer treatments, we always advise folks to keep an open mind about all potential risks and rewards. Having read the Pdf file on the Buck Mountain Herbal site, which manufactures neoplasene and adheres to safety standards in the production, I read numerous DVM reports of this working on a variety of cancers. It does involve meticulous care during the process, but it worked. The article quoted on your site is incorrect on its presentation of no documentation, etc. i carefully select my neoplasene patients and have had some amazing successes and a few dismal failures. for inoperable tumors in the skin it’s been a Godsend. i’ve cured mast cell tumors between foot pads and fibrosarcoma on the carpus, albeit with dramatic wound management post treatment. and i’ve had survival rates of 8 months for grade 3 mast cell with just the oral. no this is not a miracle cure for cancer but i’m dismayed by some practitioners complete disregard for this powerful tool in the fight against cancer. THIS article is loaded with BS, I guess that’s why there is no citation for the author’s name (and credentials.) Do your own research and in 5 minutes you will find out several “facts” presented here are false. #1 Neoplasene is NOT an escharotic. #2 The “facts” quoted in the article from the JAVMA’s August 2011 PAPER are not specifically regarding NEOPLASENE; the wording is very intentionally referring to VARIOUS bloodroot and “black salve” concoctions and refers to them IN GENERAL. I don’t think you could consider Neoplasene an “herbal concoction” either, as it comprises some constituents from bloodroot, halogens and water. Nevermind what I write, you can read directly from the website at http://www.buckmountainbotanicals.net. Also of note, regarding the last sentence’s references to two dogs’ cases that apparently went awry, you can also find a bunch of case studies showing favorable, if not “miraculous” results. We should also compare the average costs and success rates of Neoplasene cases vs. the costs of the visiting oncologist’s amputation factory and her (their) success rates. It’s no surprise, really, when you consider the cancer treatment industry would stand to lose 90% of their revenues if everyone chose less invasive, more natural and likely very much more successful treatment options. Hello Terry. I, the author, Rene Agredano, wrote this “BS” piece after an indepth conversation about neoplasene with respected veterinary oncologist Dr. Turner. What I relayed in the article is what we discussed. It did not come from a website that profits from the sale of unproven “treatments,” like the one that you reference. 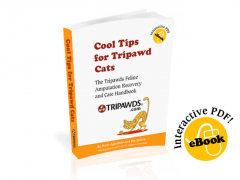 I am happy to include other opinions about any alternative therapy but when it comes to documented evidence about side effects of unproven treatments, Tripawds will always stick with the “better safe than sorry” approach. We appreciate your taking time to share your opinion, but respectfully disagree with your feedback.